• Haiti Twitter information, compiled by the ATLAS program at the University of Colorado. Organizers suggest following a standard syntax, to make conversation and connecting more effective. communications data related to the quake is here. The Haitian staff are showing signs of stress. Many of us here are experiencing loss of appetite, nausea and headaches. The constant movement of the ground makes our buildings sway and that is causing motion sickness, as well as high levels of anxiety. The children are fairing remarkably well. • The tweeting Carrier USS Carl Vinson (@CVN70) will serve as a 'floating airport' for Haiti relief operation. 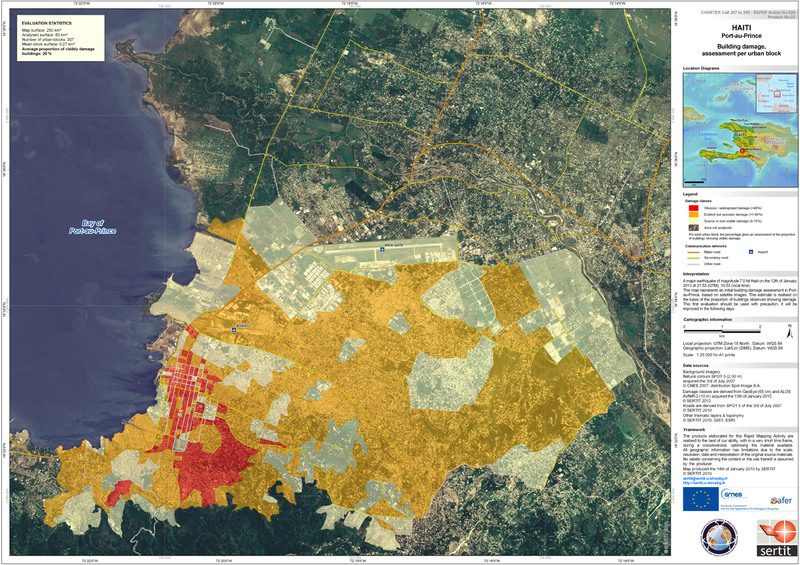 • New satellite maps of Haiti coming in: "Damage evaluation map based on satellite data over the Port-au-Prince area of Haiti, following a 7.0 magnitude earthquake and several aftershocks that hit the Caribbean nation on 12 January. Map based on data from CNES's SPOT-5, JAXA's ALOS and the U.S.-based GeoEye-1 satellites; processed by SERTIT. " Click for full-size. • Dan Harris, ABC News: "Saw my first real bout of looting in #haiti today. People are openly and increasingly worried re social unrest here." • Boston Globe's "The Big Picture" blog has two posts with incredible, powerful photographs from Haiti over the past few days. Here is part one, here is part two. • The New York Times' "The Lede" blog is an excellent source for ongoing analysis and news updates. Also, see this interactive map, using satellite imaging data from GeoEye, which shows the capital city before and after the earthquake. • Danger Room: tweets from the front line of Haiti relief. • At night, Port au Prince is lit by burning tires. • Some 300,000 people have already been displaced by the disaster. • Democracy Now: US Policy in Haiti Over Decades "Lays the Foundation for Why Impact of Natural Disaster Is So Severe"
• Haiti's largest jail collapsed in the earthquake, and all the inmates fled, according to a UN report. • Catherine Lainé (Boing Boing Video interview with her in Haiti) tweets, "Things you can do: Call your congressman/senator re: cancelling Haiti's debt. The country will need every penny to rebuild." • Jay Smooth of Ill Doctrine published this excellent video op-ed today: Mini Doctrine on Haiti.